I have been so lucky as to be able to follow this Canadian band since the release of its debut album Once Only Imagined (review posted 06/09/2007). Already a stylistic sensation on that record, the guys (and frontlady) improved on their style for the sophomore album Lullabies For The Dormant Mind (review, again by yours truly, posted 01/02/2009) and, frell me, if they did not go through yet another progression since! And that this progression is definitely a positive one, is something I want understood from the get-go...so we don't get any mistake in about that, okay!? Blueprints for the album were originally penned by guitarist Danny Marino and frontlady Alissa White-Gluz, and then further fleshed out by the rest of the band. A process which the band already used on the previous material, with that difference that this time around the band took far more time on each song separate in the rehearsal room and pre-production phases. Well now, doesn't thàt sound nice? If you hadn't heard of this band before, then by all means check out the audio and video available at the band's page at (www.) 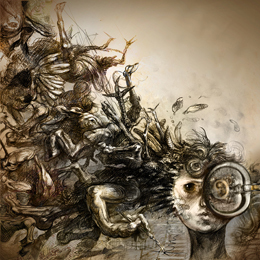 myspace.com/theagonist. My apologies for having the review posted so late, but both professional and personal events in my life prevented me from doing what needed to be done. To conclude this review, let's state that Prisoners was already added to my 2012 year-lists when I first heard the album, somewhere in mid-August of last year.